The capability you’ll find inside and out of the 2016 Express Passenger Van is matched by the powerful performance of our Vortec V8 engines and available Duramax® diesel. The available Duramax 6.6L Turbo-Diesel V8 provides the most torque of any vehicle in its segment. An available 6.0L V8 engine features 342 horsepower — the most of any engine in its class. The standard Hydra-Matic® 6-speed automatic transmission includes Tap-Up/Tap-Down Driver Shift Control and auto grade braking to automatically slow the van using the engine. 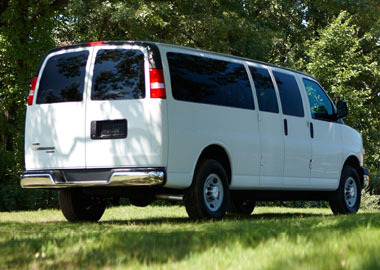 Express 3500 Extended Wheelbase Passenger Van makes getting everyone there a little easier. 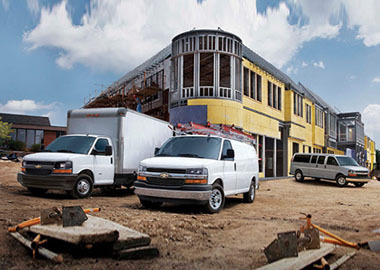 The Business Choice Program helps make your vehicle work-ready with a GM Accessories Cash Allowance or Upfit Cash. Business Choice is also stackable with most retail offers. Express Passenger Van is the first van to offer available built-in 4G LTE Wi-Fi® connectivity. This powerful, reliable signal gives you the ability to seamlessly connect your smart devices to the Internet. In fact, up to seven devices can be connected at once, so your Express is truly the ultimate mobile Wi-Fi® hotspot for your passengers. Express Passenger Vans come standard with head-curtain side-impact air bags and new seat-mounted thoracic air bags. Also standard is Enhanced Technology Glass, which provides an added safety feature as it protects passengers from exiting the vehicle on impact. These are just some of the ways we’re committed to helping keep you safe. OnStar® Automatic Crash Response, standard for six months on full-size vans, means built-in sensors can alert an OnStar Advisor that you’ve been in crash, whether or not the air bags deploy. Visit onstar.com to see the amazing ways OnStar can help keep you safe.